Welcome to MOVIE MUSIC MANIA, where we talk about some of the amazing music that shapes the films we love. 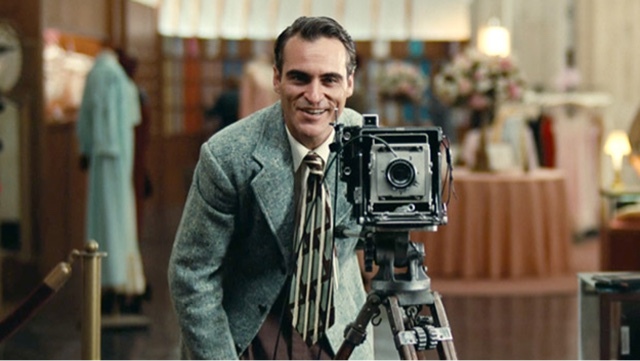 This week we take a look at the amazing score behind Paul Thomas Anderson's film...THE MASTER. The man behind the score of The Master is a frequent collaborator of Paul Thomas Anderson, Jonny Greenwood. Greenwood is the guitarist for the alternative rock band "Radiohead" and has worked with PTA on many of his films. PTA is known for his films to be a bit "off the wall" and intriguing as far as content and style. He's not a traditional filmmaker, so it only makes sense that he would collaborate with a non-traditional musician like Greenwood. Here is the opening scene to The Master with the score already giving us an unsettling and almost dream state like vibe. And though Greenwood is a master of creating unease and putting us as an audience into a state of trance, he is also a master of capturing an essence, an emotion. He manages to understand the feeling PTA is trying to thrust upon on the audience and Greenwood assists in this with his scores. He makes us as an audience begin to fully understand what a scene means or represents. Greenwood can bring us from happy and content to dark and depressing. Here's a scene from the film where Greenwood catches the joyful essence of the film. Notice the score is not potent here, just slightly hidden under the surface to create the extra pizazz of joyfulness. Jonny Greenwood and Paul Thomas Anderson are a match made in heaven of sorts. The two understand and create magic. Film expresses emotions for us as an audience that we may not be able to verbally express. But, with two geniuses at the helm like Greenwood and Anderson. We can feel and understand these emotions. We need to appreciate pure art more and more, and with artists like Greenwood and Anderson around, it won't be that hard. With that, I leave you with a personal favorite scene from the film. Not score heavy, but incredibly beautiful, elegant, and inspiring to watch.